Well, hello all. It took me time to get this BT-42 done. There were a couple of things holding me back - first of all is that weird Q.F. 4,5 inch howitzer Mark II which sounds big and nasty, but really wasn't that much so (however I could not find the table of penetration values like I could for the main gun on a BT-7 for instance, so really could not quantitatively compare, had to rely on online sources, which may not be that credible though). Reports however stressed that half the munitions fuses also failed to go off when hitting the T34/76's, and even when they did, not always did they pierce the armour. So caliber-wise it would be close to a SU-100, but realistically, caliber is not everything really, and they were a complete failure after all - the STUG III replaced these in the same category. But, we would like a game-wise playable interesting exotic tank, right? 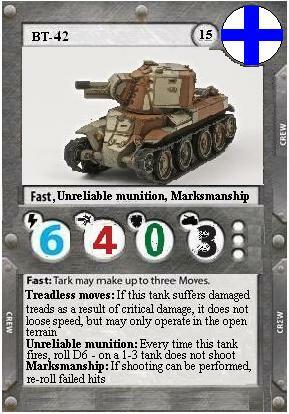 So, firepower, I gave it the same as a STUG III (since they replaced the BT-42 in this category). I added the unreliable munitions to account for the fact that some projectiles failed to go off. I would be happy to hear any critical comments and suggestions from anyone. Hope to hear some replies soon. Hello people, look, if you are looking at this and thinking that it is crap, don't hold back your comments - I need critical feedback to get these things going, so basically I won't be aggravated if you give constructive negative feedback so I can change stuff accordingly. "Go, go, keep advancing! The one who manages to claim victory gets to take home the pasta!" Afraid I don't have anything constructive to go with this, besides it looks good to me. Aside from the cartoon reference I haven't read up on any of the tank, so hearing about the unreliability of the ammo was a surprise. All the logic makes sense and it brings a twist to the gameplay. Thank you for creating and sharing the card! OCDPaul wrote: Afraid I don't have anything constructive to go with this, besides it looks good to me. Aside from the cartoon reference I haven't read up on any of the tank, so hearing about the unreliability of the ammo was a surprise. All the logic makes sense and it brings a twist to the gameplay. "The Finnish HEAT shell was called "114 hkr 42/C-18/24-38 is 32-18/24" and it was equipped with a "Hl/C" warhead. The German 10.5 cm HEAT grenade, which it had been modelled after, could penetrate 100 mm of steel at a 60-degree angle of impact. Thus it was estimated that the Finnish shell, with its larger calibre, could penetrate 110-115 mm, but its fuse very often failed to function properly, leaving the projectile simply bouncing off on impact without doing any meaningful damage." "HEAT-ammunition used with howitzers of BT-42 had proved totally useless during Viipuri battle, proving the vehicle defenseless against enemy tanks." Actually, this topic has opened a new theater of war to study which seems quite interesting to me. So that's good, Tanks! are giving me more than just tank battles in miniature... they nudge me to study history. Not to mention the fact that I left out mechanical unreliability - BT-7 was not designed to carry such a heavy turret, Christie suspension was overloaded, so mechanical faults were rife, but that would make the tank completely unusable from game terms, so I left that one out as well. After all, this is one of my most favorite machines here, I would like to get use of it... and this comes in hand with the "what-if?" - yes, what if the ammunition wasn't crap and was of properly working AP stuff. Actually, just an additional bit of info, these BT-42 main weapons proved to be good use against enemy bunkers, entrenchments (same source - Jaeger Platoon I mean). So basically it is more of a self-propelled howitzer for infantry support. Makes sense really, if you put a massive howitzer on tracks, you'll get.... a massive howitzer on tracks. Just putting a big caliber howitzer on-top of a tank wouldn't make a cheap version of a SU-100, different weapon classes. Oh yes! I always enjoyed armor but more of a 'gee, that certainly is neat' aspect but I got nerdy about WWII warbirds in my youth. Really it's with the models and the game recently that I diverted my nerd/ocd powers into really getting into armor. So similar boat as you that I'm reading and researching so much more into the ground side of WWII and the surrounding wars. I was Beyond fortunate that about 15ish years ago before my grandfather passed he took me to the Aberdeen Proving Grounds in Maryland, I had no real idea of the significance of so many of the tanks at the time, but now going through pictures that I took and the ones on the web, I can say I saw and touched some of the rare ones I was disappointed to find out now they moved most or all of them further south from me and have them hidden away from public view to restore them (assuming budget and if they every do it, going from memory they started moving in 2012 and have no updates). It took me way to long to figure out some of those Japanese tanks, the different types of Type 97 and the ways they named them. For my GuP collection I still need to buy enough of those to at least outfit what was seen in the movie. I only have the Type 95 Ha-Go in 15mm, one of those Axis and Allies miniatures (that needs some greenstuff modifications and paintjob). I like Battlefront products but some of those are budget busters. I'm not sure if I can be any help with working out the cards, but you know I'll be printing out and using anything you come up with! I kind of have been assuming the base of the 97 is the same for all the different turrets? Like the Chi-ha, Chi-ha Shinhoto , and Chi-Nu could have similar stats except tweak the firepower accordingly? And we might only have 3 active posters right now, but we do span the world at least Just need to fill in a bit is all. Well, we do have a few lurkers around at the moment. Hopefully, as time goes on, they'll make their presence known. Hopefully, I'll be able to attract some more members at Hammerhead - I'm thinking of putting together some leaflets with the forum address on to hand out while I'm there. To return to the topic in hand - keep up with the good work with the cards. I've done a couple myself but don't seem to have the knack. While I may not comment on evey card you produce, I read them with interest and look forward to what you'll come up with next.